Oh how I hate feeling of being sick. Once I become ill, I turn in to the worse cry baby that surpasses any problems in the terrible toddler years. Lucky I have not gotten ill over the past year (knock on wood), but close friends and family have all been sniffing and in terrible pain over the past few months. All the time I just want to make them better again, so they can return to their normal selves but sometimes I know there is only so much I can do help them. One of the ways of making people feel better is to bake them food from their homeland. So over the past months I have been making steamed custards, sweetened condense milk egg tofu and red bean desserts to remind my Asian parents of the comforting sweets from their childhood. Of course, I cannot recreate the recipe exactly or make it taste like their mother’s cooking, but I willing to give it shot. 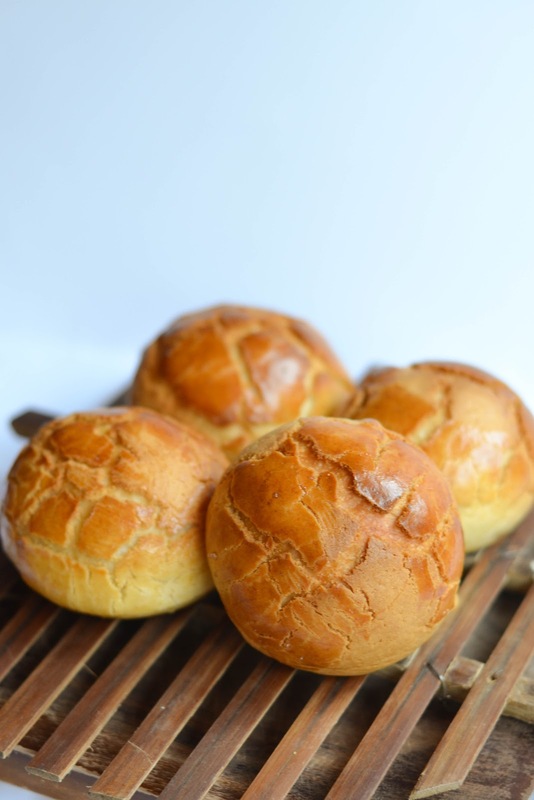 This classic Chinese bakery staple, Po lo bao or more commonly referred to a pineapple bun. A fluffy cake like round breads surrounded by a sweeten cookie dough brush with egg yolk to give them a golden finish. 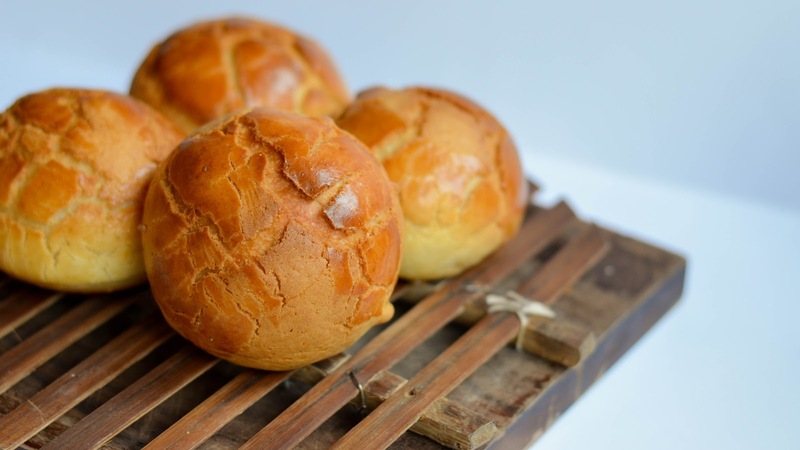 I have recently made theses buns, after I once attempted them in my very, very early days of baking ( and yes this is before I realized people blogged about food). I have adapted to my taste and method like sweetness and richness of the cookie, but like all cooking, it is a matter of taste. Makes approx 20-25 buns. About 40 g each. Plus one egg for coating. 1. Place yeast in warmed milk and 20g sugar for 30 minutes. Make it nice and bubbly. 2. Add flour, remaining sugar, milk powder, salt, water in this yeast mixture. Mix roughly. 3. Add egg and oil and kneed for 20 minutes. I do this by hand, so with a mixture it might be shorter. Please note this is a wetter dough, but floured lightly hands will do the trick. 4. Rest for 10 minutes. Kneed again for 10 -20 minutes until it is glossy and has passed the window test (test for fully developed gluten in dough). 6. During this time prepare cookie topping. 7. Line two baking sheets with grease proof paper. 9. When doubled, Press down and divide into small 40g balls. Cover for 45 minutes. 1. Cream butter and icing sugar till very fluffy. 2. Add egg yolks one at a time, beating after each addition. 3. Add vanilla and salt. 4. 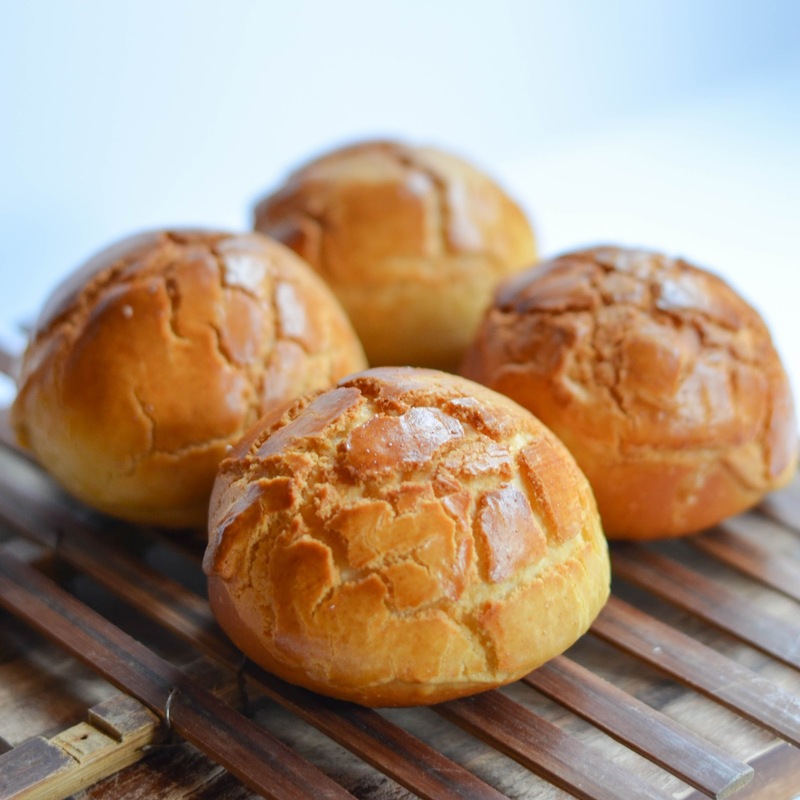 Mix in flour and corn flour till it is combined and forms a dough. 5. Roll into a log, wrap in Cling wrap and fridge until use. 1. Take out cookie dough from fridge and slice log into 20g slices. 2. Between two pieces of cling wrap, roll out slice into a rough 3mm thick circle. 3. When breads are fully risen, place each rolled out cookie disc onto a bun. 4. Brush with egg wash.
5. Place in oven. Turn down to 180c and bake for 15 -20 minutes. Bread heals all. No question about it. Thanks for this recipe post. 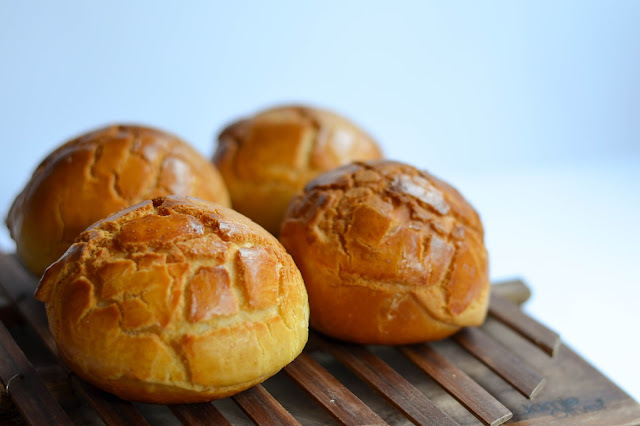 Your Po Lo Bun looks great and I’m going to try making it. I’ve got all the ingredients except for cornflour. Can I substitute it with regular flour or does cornflour have a big impact on the cookie topping outcome? Thanks so much. the corn flour is used to reduce the amoutn of gluten in the cookie toppping. This results in a crumble, softer cookie toppping, rather than a crisp one. While it provides this property, it really does not have a dramatic effect. Your cookie may not crack as much and be harder. You can sub with rice flour or potato flour if you have those too. Hey Laura! That is great! make them for your friends and family, most people love these.